Because Alkyd colours are not capable of producing the same rich range of mixed colours as standard oils, I’ve increased the number of starting colours on the palette. I’m using 6 colours plus traditional oil Titanium White and Ivory Black. So its a mix of Alkyd and traditional oils. I like the speed of drying of the Alkyds. I don’t like the lack of richness in the resultant mixes. This is an interesting characteristic of these paints. The pigments are the same as in oil paint but the binding agent is similar to Liquin. Why they should behave differently is very curious. I have just completed another painting with the same selection of colours and found the same limitations in mixing. I have found new effects caused by fast drying, however. The surface of the painting can be made more textured by dragging wet paint across an almost dry under layer. This is something I can’t do with standard oils, painting alla prima. Layers of different colours can be placed on top of previous layers, partially covering them to build up complex rich textures as the individual colours don’t blend together. I think I will try a slightly different approach next time. I will use Alkyd colour up to a certain point in the painting using solvent only, then switch completely to standard oils. Alkyds are more transparent and I have found this to be the case especially in solvent washes. This is good for shadows. The more subtle shades available in standard oils I’ll use in the mid-tones and highlights. Here is the video of the above painting. See you soon. 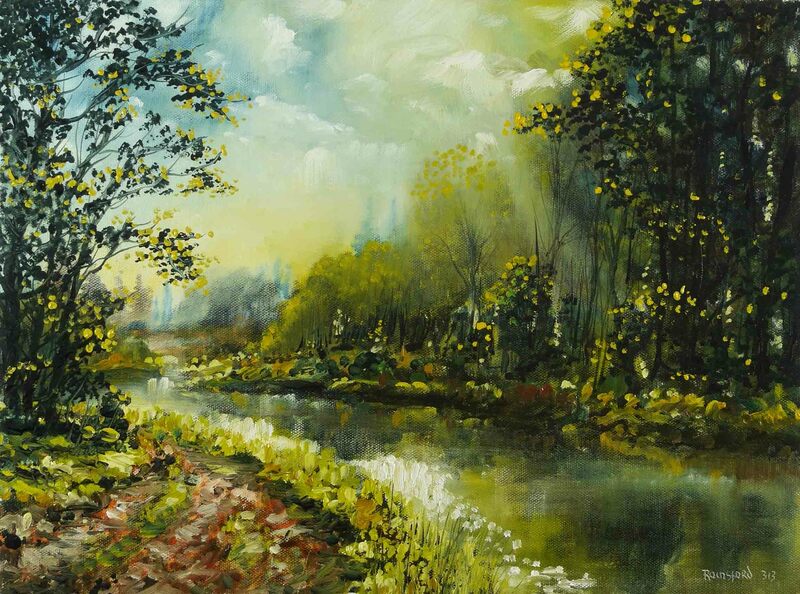 This entry was posted in Oil Painting and tagged Alkyd, Art, Clouds, Culture, Education, green, Inspiration, Irish landscape, Oil Painting, Oil Painting Instruction, Oil Painting Landscape, painting, Pictures, river, Sky, Time lapse painting, Trees, Water. Bookmark the permalink. Thank you Harriet for such a lovely comment. I’m delighted you find the videos helpful. Thank you, I’m happy you like the work.